Osteoarthritis (OA) is the most common type of arthritis. On the other hand, rheumatoid arthritis (RA) is recognized as the most crippling or disabling type of arthritis. But what are the significant differences between them? Osteoarthritis is also referred to as a degenerative joint disease or wear-and-tear arthritis. It is caused by the breakdown of joint cartilage, a cushion between the bones that form a joint. Cartilage loss can cause a bone to rub on another bone in the joint—a condition that is very painful. Usually, osteoarthritis begins in a single joint. Affecting over 27 million people in the United States, osteoarthritis is most common in people older than age 65. All races in the U.S. appear to be affected equally by osteoarthritis. According to the American College of Rheumatology, 70 percent of people over the age of 70 have x-ray evidence of osteoarthritis. Rheumatoid arthritis, on the other hand, is a chronic, inflammatory type of arthritis and is also classified as an autoimmune disease. The synovium (lining of the joint) is primarily affected by rheumatoid arthritis, but organs body-wide can be affected as well. Multiple joints are usually involved with rheumatoid arthritis. 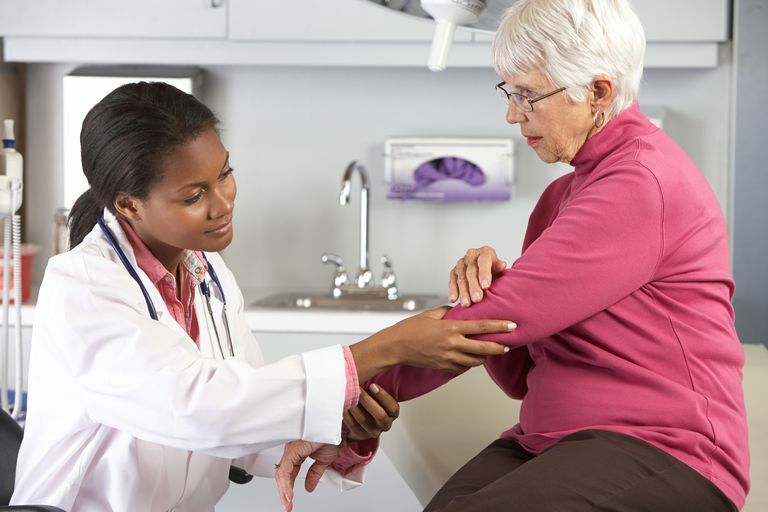 Approximately 1.5 million people in the U.S. have rheumatoid arthritis, and about one to two percent of the world's population are affected by it. About 75 percent of rheumatoid arthritis patients are women. Men, women, and even children can develop rheumatoid arthritis, though. Typically, disease onset for rheumatoid arthritis occurs between 30 and 60 years of age and the majority have no family history of it. When it occurs in men it usually strikes later in life. Osteoarthritis is a joint disease which affects the cartilage. Scientific conclusions about its causes are evolving away from simply being wear-and-tear or the effects of aging. Moreover, water content of cartilage initially increases with osteoarthritis while protein composition of cartilage steadily degenerates. Other factors that may increase the risk of developing osteoarthritis include joint injury, repetitive use or stress of joints, being overweight, and family history/genetics. With regard to rheumatoid arthritis, researchers have worked for years to find the cause of the abnormal autoimmune response associated with the disease. No single cause has been found. Common theories point to a genetic predisposition and a triggering event or events. This is where some similarities occur. X-rays of affected joints can show joint damage associated with osteoarthritis or rheumatoid arthritis. Arthrocentesis, joint fluid removal, and joint fluid analysis are possible procedures that can assess osteoarthritis or rheumatoid arthritis. The results differentiate which type of arthritis is involved. Blood tests cannot definitively diagnose osteoarthritis, but may be used to rule out other conditions, including rheumatoid arthritis. Test results, a physical examination, and the patient's medical history together can help determine a diagnosis. Treatment options for osteoarthritis focus on pain relief and restoring function to the affected joint. Medications are commonly used to treat osteoarthritis. Nonsteroidal anti-inflammatory drugs (NSAIDs), analgesics, as well as steroid injections, are used to treat pain and inflammation. Physical therapy that focuses on exercises to strengthen and stabilize the joint, support/bracing, heat, rest, and weight reduction are all important to a successful osteoarthritis treatment regimen. Alternative treatments are also used, such as massage therapy and acupuncture. For both rheumatoid arthritis and osteoarthritis, the last-resort treatment option is surgery. This includes arthroscopy, arthrodesis (fusion), and arthroplasty (joint replacement). Arthritis Foundation. Understanding Arthritis: Osteoarthritis. Arthritis Foundation. Understanding Arthritis: Rheumatoid Arthritis.